In this article, we will learn two things, how to implement a linked list from scratch in Java and how to write a unit test using JUnit framework. Though Java has LinkedList class, which is an implementation of the doubly linked list, its good to know how to implement singly linked list in Java, mostly to practice coding interview questions. Coming to back to writing a unit test, from time to time, I have said that a Java programmer must write unit tests. IMHO, unit testing is the best development practice to improve code quality. Fortunately, Java ecosystem has the luxury of great unit testing frameworks in form of JUnit and TestNG, and every Java developer should take advantage of this. Writing unit test is one of the best programming practice along with code review. It's natural and I had experienced it myself that unit test, not only provides code coverage, but also present unique opportunities for code refactoring. Many times, while writing unit tests, I have discovered better names for my methods and refactored large methods into smaller ones. JUnit tests also helps to organize code and evaluate encapsulation. There is a good chance of you discovering that a particular field or method is exposing implementation detail, and should be abstracted in public method. What all this means is, you, a Java developer, must write unit tests. Since it always helps to start smaller, this JUnit tutorial will present another simple JUnit example to show how to write unit test in Java. In this JUnit tutorial, we will implement a linked list in Java and we will write unit test cases for a linked list. For those, who are not familiar with the linked list, it's one of the fundamental data structure to store objects, like an array, which is also used to store object. By the way, there is much difference between linked list and array data structure, which is subject of another blog post, but the main difference is in the way objects are stored. An array needs contiguous memory, while linked list doesn't need that. * A Simple linked list implementation in Java to demonstrate unit testing. * JUnit tests will be created to test this singly linked list. When you run these unit test as shown here, you will see following output, which is self explanatory. Had any test failed or an error occurred e.g. an unexpected exception, JUnit would have shown that in this output. Now, there are couple of approaches to write Unit tests in Java. Some programmer prefer to write unit test based on functions e.g. testAppend(), testIsEmpty() or testLength(), and this is also default approach used by IDE like Netbeans and Eclipse. By the way, you can also combine small tests into a complete one, by testing use cases e.g. testing a fresh linked list without any element, testing a linked list with some elements etc. In this JUnit example, I have combined test of all three methods into one. Though it's not complete, but it test one use case. You can still add more test cases to test append() with different input e.g. null. Any way let's have a look at our JUnit test case. * JUnit test cases for linked list data structure in Java. I have just kept one method testNewLinkedList(), annotated with @Test annotation. This is the minimum requirement for writing unit test for Java programs. of course you can use other JUnit 4 annotations like @Before, @After, @BeforeClass or @AfterClass to do some setup and cleanup work, for this JUnit example, we don't need that. If you notice, I have also put comments around tests to make test cases more obvious, One of the code comment best practice to follow while writing unit tests. You can use this example to further learn writing unit test, I would suggest implement few more methods like delete() and start writing test cases for that. Working with linked list not only helps you to understand unit testing better, but also improves your data structure concept, as linked list forms a good chunk of data structure interview questions. 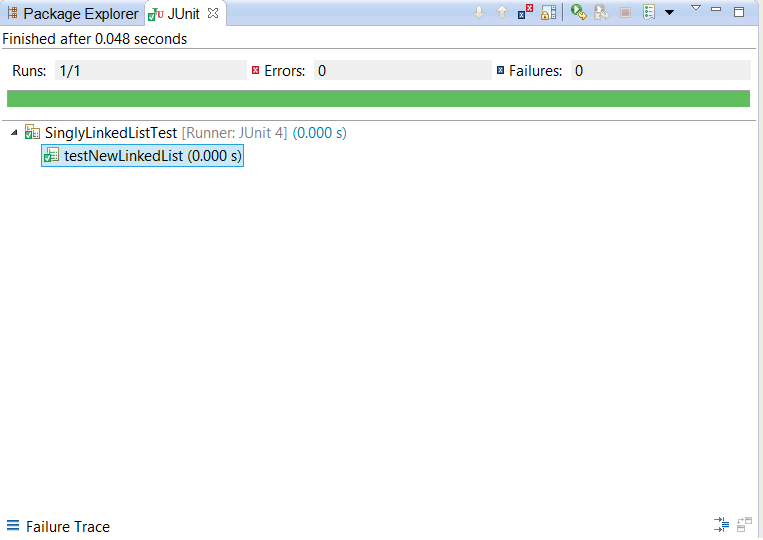 That's all on this simple JUnit example of implementing singly linked list in Java and writing unit test using JUnit. Follow the principle of start small and improve step by step. In order to develop unit testing habit, you can also create empty test method, while understanding requirement and coding, and mark them with @Ignore annotation, to avoid failing tests. Just like coding, unit testing is also an art, which gets better with practice and constant improvement. If we write a unit test only to test one purpose, the name of the test will be self-explanatory and when you see your build failed in your Continuous Integration you will know immediatelly what is wrong and what to correct. I think, both kind of approach has its place in unit testing. Yes, encapsulating one mehtod in one test will tell us problem more precisely, but testing multiple method at the same time will allow you to create more scenarios. Lik in this example, if this test fails you will come to know there is some problem with new linked list object and stack trace will guide you to the right place. You can similarly create a test where you append() and delete() a node to end up with empty list again. Here length() and tail() method can be optimized by taking length and tail as instance variable. Modify both inside append() method as required so that there would not be any while loop in length() or tail() method to know length or tail node respectively. By this we can reduce time complexity of both methods from O(n) to O(1). This is good linked list implementation but its just a singly linked list. I want to implement doubly linked list in Java? Can anyone please guide me how to implement doubly linked list in Java? If you try to add one more element in the linkedlist, the above program will not work. there should be some correction in tail().